I recently had the pleasure of reviewing 2 books for Catholic Exchange by author Mickey Addison. I highly recommend them, especially for anyone who may be intimidated by official Church documents. It’s refreshing to run across a new author who obviously understands the faith, but writes in a very down to earth style. Check out his website if you get a chance! From 2006-2008, Michael “Mickey” Addison Jr. wrote a weekly blog for RosaryArmy.com in which he reflected on various teachings of the Catholic Church. As an Air Force officer, catechist, author and speaker, Mickey has a wealth of experience from which to draw. 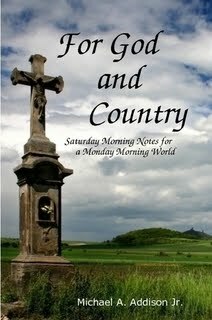 For God and Country is a collection of his blogs that will appeal to anyone with a desire to integrate the Catholic faith into their daily life. Written in a friendly anecdotal style, you’ll find yourself learning much about Catholic teaching while being thoroughly entertained. Beginning with the touching story of his reversion to the Catholic faith while stationed in the Kuwaiti desert, this volume covers everything from “marshmallow churches” (Christian churches that have fluffy sweetness, but lack the real presence of Christ found in the Catholic Church) to the observations of C3PO (from Star Wars: A New Hope) and his views on suffering! 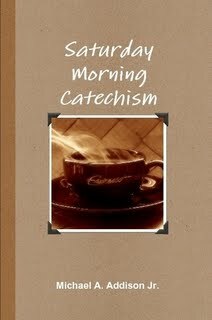 Addison’s follow-up volume, Saturday Morning Catechism, continues where the first collection left off and presents additional examples of how God is truly everywhere. Important topics such as the Sacraments, the rosary and the Ten Commandments are seamlessly embedded in his stories of daily life events. As with the first book, the beauty of this volume lies in its simplistic, but thorough, explanation of complex theological topics. By supplementing his stories with excerpts from official Church documents, the author provides a practical way of applying the teachings of the Catholic Church to ordinary situations. It is obvious from reading these two books that Addison has perfected the art of seeing the extraordinary in the ordinary occurrences of daily life. As I read through these short stories, I found myself pausing and reflecting on how God’s presence permeates my own life experiences. What impresses me the most about these books is Addison’s ability to eliminate the “fluff”, while still writing in a very easy-to-read style. After reading his work, there is no doubt that Mickey Addison is completely loyal to the Magisterium of the Catholic Church and loves his faith!